The exploitation title may not do it any favors, but this biopic based on the incredible life journey of Sam Childers—a drug-addicted, violent, low life biker redeemed by God and Sudanese orphans—is gripping, inspirational and well told. 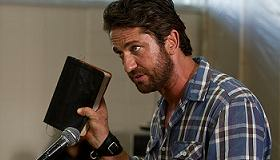 With a bigger-than-life first rate performance from Gerard Butler, Machine Gun Preacher could indeed find box office traction from both mainstream audiences and also the fickle Christian moviegoing populace who might find it enlightening if they can stomach the opening scenes—and, of course, that title. Dropped by Lionsgate and picked up by Relativity for an awards season run, the film is worth the effort even when it stops straight-shooting and starts preaching. Sam Childers (Butler) is a hard-living addict who lived on the edge and does his talking with a gun. In order to save his family life, the biker discovers God. But things really turn around for Sam when he goes to dictator-run East Africa on a church mission to help repair war-ravaged homes. While there, Sam discovers unspeakable horrors, particularly in the faces of innocent kids. Against all odds, he resolves to build an orphanage, a quest with repeated financial and physical challenges, especially when the Lord's Resistance Army that rules swaths of Uganda and the Sudan wants to conscript these kids into soldiers for their cause. This isn't mere modern sainthood. The truth, as ever, is more complicated. Sam becomes a man obsessed, using his gun and his pulpit to forge a new life for these youngest of victims. Which, of course, takes a great toll on his family, particularly long-suffering wife Lynn (Michelle Monaghan) and daughter Sara (Madeleine Carroll) who feels he cares more about these kids on the other side of the world than he ever did about his own. And there's a new set of struggles in his relationship with his slacker best friend and former partner in crime (the inimitable Michael Shannon). Working from Jason Keller's script, director Marc Forster presents a portrait of a man charging blindly through a crossroads. Thanks to a pitch perfect portrayal from Butler, we can completely empathize with Childers while questioning the cost of his commitment to the cause. Butler has never been better and clearly felt energized in taking on the role. He does his real life counterpart proud and dominates the action throughout. The images of the innocent faces Forster shines on on screen are not easily forgotten—despite the flaws in Childers' plan, you can easily see why the real man continues to dedicate his life to them to this day. Monaghan is also very fine as the suffering wife who uses faith to get her through this family crisis. Shannon nicely underplays his role as a man whose own lifeline is teetering on the edge. And there's terrific work from Souleymane Sy Sevane as a local who assists Childers' cause. The strong Christian elements in the film almost make it seem as if it was intended to be a faith-based movie, but these filmmakers go way beyond the simplistic or saccharine. Machine Gun Preacher delivers a riveting account of one flawed man's efforts to bring humanity and the grace of Heaven to hell-on-earth.